If you're in search of a casual yet incredibly chic look, dress in a black leather biker jacket and navy skinny jeans. Both of these items are totally comfy and look fabulous when worn together. Why not introduce black leather ankle boots to the mix for an added touch of style? If you're a fan of relaxed dressing when it comes to your personal style, you'll love this super cute pairing of a black print kimono and dark green leggings. Lift up your getup with Matisse Caty Western Pointy Toe Bootie from Nordstrom. If you're looking for a casual yet incredibly stylish getup, make a black silk dress shirt and a black sequin mini skirt your outfit choice. These two pieces are totally comfortable and they will also look fabulous paired together. When it comes to footwear, this look is complemented brilliantly with black leather ankle boots. If you're in search of a casual yet stylish outfit, go for a beige shearling vest and grey skinny jeans. Both pieces are totally comfy and will look fabulous paired together. Dress up your getup with Matisse caty western pointy toe bootie. If you're on the lookout for a casual yet totaly chic outfit, choose a white blazer and black skinny pants. Both of these garments are very comfy and they also look wonderful paired together. When it comes to shoes, this ensemble is complemented brilliantly with black leather ankle boots. If you're all about practicality dressing when it comes to your personal style, you'll love this totaly chic pairing of a brown blazer and black leather leggings. Amp up the cool of your outfit by rounding it off with black leather ankle boots. 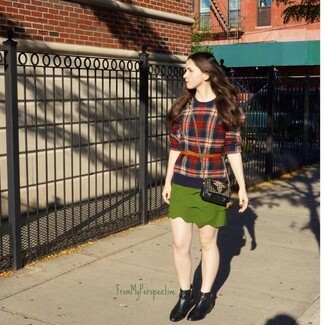 If you're a fan of functionality dressing when it comes to your personal style, you'll love this incredibly chic pairing of a navy plaid crew-neck sweater and a green mini skirt. Got bored with this ensemble? Enter Matisse Caty Western Pointy Toe Bootie to spice things up. For a casual chic ensemble, choose a brown fur coat and black skinny jeans — these two items go beautifully together. When it comes to shoes, this look pairs wonderfully with Matisse Caty Western Pointy Toe Bootie from Nordstrom. If you're in search of a casual yet absolutely stylish look, reach for a black puffer coat and a dark purple tweed sheath dress. Both pieces are very comfy and they also look wonderful together. 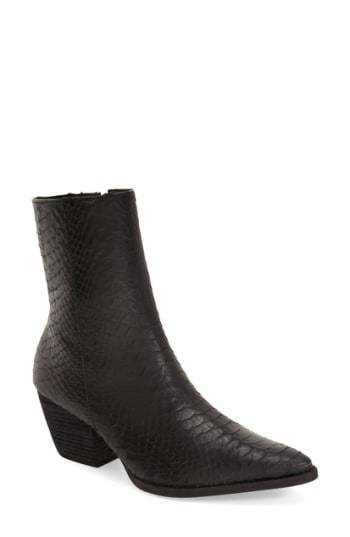 You could perhaps get a little creative in the shoe department and dress up your outfit with Matisse black leather ankle boots.